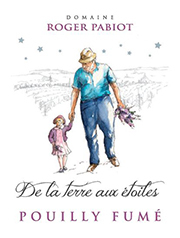 A family estate of 21 hectares, including some parcels of vines of more than 80 years old, run by two sons, Gérard and Bernard, who combine traditional practices with the modern techniques they have learned in legendary wine-growing areas: Beaune, Macon and Bordeaux. The estate is planted on the best hillsides overlooking the Loire, with very representative soils of the region: hard limestone, flinty clay, sandy terraces and Kimmeridgian marl, with each type of soil contributing its own qualities and creating a wine which has very particular characteristics on a terroir which does not. Their Pouilly-Fumé Cuvée Silex is quite superb, combining complexity and finesse, with a subtle nose of notes of honey, flowers and spices. The mouth is very marked by the soils, giving it a mineral taste and great freshness. It is a racy, very well-balanced, powerful, ample wine with very good development. The Pouilly-Fumé Coteau des Girarmes is remarkable, with notes of fresh fruit and lime-tree, a fleshy, aromatic wine which is ample, fruity and lasting in the mouth. A member of the Individual Wineries Federation.